Zambia’s President Edgar Lungu has promised the people of Chongwe District a new market after the demolition of the old one. Speaking in Chongwe yesterday during the official launch of the keep Zambia clean national wide campaign in Chongwe District, the President said that it was in line with government’s commitment to take development to the districts. The President called for cooperation between marketers, local authority and the district authority to avoid wrangles which have existed in the recent past. Scores of Chongwe residents joined the President as he inspected the state of Chongwe main market and later joined in the cleaning exercise. The head of State assured Chongwe marketeers of government’s intention to urgently construct a modern main market upon the demolition of the old and dilapidated one. He instructed the local authority to ensure that prior to its demolition, the Council should fully register all existing marketeers and ensure that each one of them is reallocated a trading stand in the new market. “I do not want a situation were people from Lusaka with big bellies and thick Necks come to take over trading places in the new main market. That I will not tolerate. We have heard of situations were upon the construction of a modern market, new marketeers emerge. I will not tolerate that. Bwana Mayor, ensure that there is a proper record of the names, NRC numbers and residential address for the existing marketeers here! They should all be relocated to the modern market upon construction,” President Lungu said. 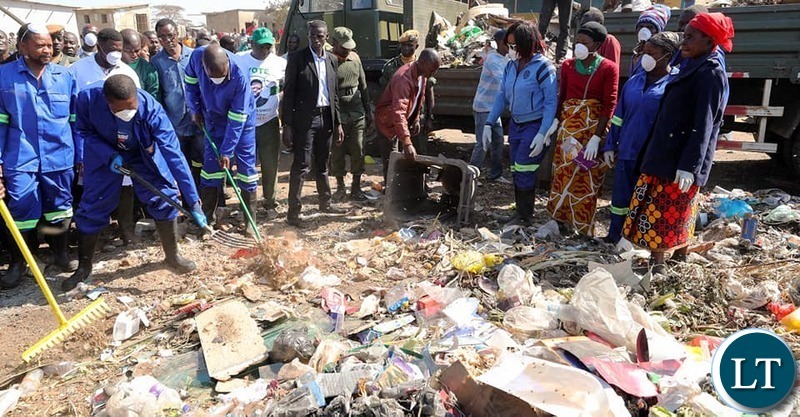 The President further said that he was impressed with people’s commitment to the desire to keep their environments clean, as he joined millions across the nation in the keep Zambia clean national wide campaign scheduled for the last Saturday of each month. But our president is a disaster. What he should be doing is to create systems that will be there even after he is gone.Keeping our environment clean is a job, people should pay for this job in turn it will create employment and revenue for local authorities, for our leader that is supposedly the equivalent of pythogaras theorem. It is only in disfunctional communities that people create clean up days. Picking up shovel and clean is easy, anyone can do it. it shouldn’t be on “what-to-do list” for Ba Edgar prepared by Freedom Sikazwe. When you see a director cleaning toilets and tables in breakroom every week, then it’s time to change company. When I tell you that Lungu is not presidential material, you call me names. As @Nostradamus has said its like the MD of a company cleaning toilets every week. Zambia is 752 618 km². When is he going to finish cleaning the whole country? He needs to set up systems for solid waste management countrywide, i.e. from garbage bin, collection, then land-fill. Not picking up a shovel in every district & saying I’ve solved the garbage problem. You even bring in cameras so that PF00Ls can see that you’re hard working. As soon as he flies back to Lusaka, the people go back to their old habit of littering as there are no systems. You might not like HH, but for sure he would have brought the best out of us all. These are missed opportunities, we have become a subject for mockery or ridicule. Common sense has become a rare “commodity”, our focus has been directed towards mediocre. That is why IMF and other sensible people are not buying into this austerity measures story being “driven” by finance Minister it is a futile venture going nowhere …. Lungu knows no better than these populist politics he cannot seem to do what is in the best interest of Zambia and Zambians for posterity. He is hell bent on fully taking advantage of the instant gratification most Zambians are preoccupied with. When I tell you this man has no leadership skills you think its a joke…this man should have just remained as minister, the role of President is too big a job for him. He should have been Works and Supply/ Local Govt Minister so he could travel country cleaning. He thinks he is Paul Kagame, Rwanda has policy backing of every exercise…how can we have a president who is always campaigning never addresses issues head on or talks about the economy. Only gullible people will what this chakolwa is spewing here. How can he build a market in a village town when he has failed to rebuild soweto market which his thugs burnt. Lungu needs to go seriously. How about just doing it!!!! Really laughable …you would be excused for thinking that this is the local ward Councillor making these utterances. How do we sustain a clean Zambia? Doing things just to be seen is not realistic. Put up permanent solutions that should support a clean Zambia. Cut down on corruption and build proper clean environment for people to trade from. PF govt declared Chongwe a municipal council and the local chief was elated. Poor lady, Elizabeth Mulenje. Out of curiosity I drove there to see the newly minted municipality. My oh my. It’s a village. Most properties weren’t designed by an architect but informal sector builders. There is needless sprawl in Chongwe but there is plenty space between buildings thereby making it more expensive to take mains water. There is nothing in Chongwe. So the mayor will collect peoples’ NRC numbers. Doesn’t Lungu know that the mayor will misuse these numbers? That’s why Zambia has a lot of fraudulent cases regarding vital documents. The president should not be the one promising people building a new market. That’s the work of their MP. It seems to me that President has no presidential agenda. It’s really in Zambia the real Africa where a president promise to build market for people. Shame ! Just the president trying to impress by sweeping is sickening, does the man know his job?Did he get proper orientation for this job?He is the president for crying out loud. Mario – when you surround yourself with Bowman as your adviser..surely what can he tell you apart from tell you to put on blue overall like he did in CB and sweep!! They even lock down the entire country to clean up.The fact that no one is questioning this insanity proves that we deserve it,and no one is even bothered about the economic consequences of such incompetence. You will die with your perpetual hatred for president. Do you see anything good Lungu has done? Oooh unless it’s your HH a man full of nothing but always wishing Zambia to be like other nations such as Rwanda and Congo. Shame on you. Stop arguing with hurting haters. I can rest assure you that these tailless bush koswes will always see black for everything that has got anything to do with ECL. They don’t wanna clean. They are the same lazy bams making our cities dirty. And now you promise a market, what happened to austerity instructions given to the Lady in Finance? 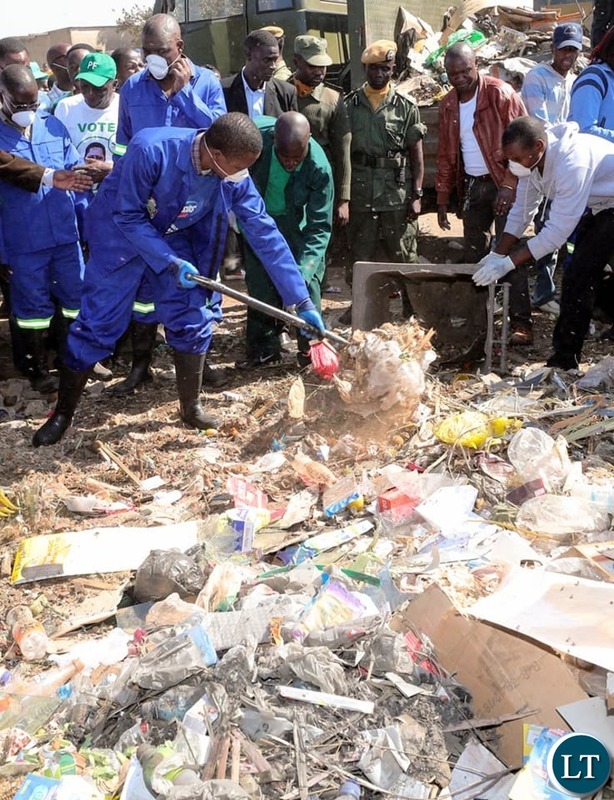 They did not pile that garbage for lungu, that is how things stand…..no systems in place for garbage collection. For the PF rats this is suitable as it provides a photo opportunity for lungu and his ministers to show they work in the community one Saturday per month…. The whole system is rotten even where roads are swept like State House/ Independence Ave you will be surprised at the value of those contracts they have awarded themselves through the council…this why we need a Mayor from anywhere but PF in Lusaka. The president is supposed to be attending AU meeting not cleaning markets. Has Soweto market been built? Why are people easily deceived? We all know we are broke. Hopefully that won’t be a nuclear plant after being demolished. Lungu going to AU summit and talk about corruption is like a Snail sliding on a salty surface..its impossible!! Take him to a public toilet not that pile of rubbish put together for for Lungu’s to play to the camera . Take him to a public toilet not that pile of rubbish put together for Lungu to play to the camera . Come on guys you dont need a president to be doing this to know that Zambia needs a good clean up. Do you know that you are close to $20 billion in debt and begging the Chinks to postpone repayment dates and restructure the loans…you can clean markets all you want but there are bigger issues to attend to. Every district in the country is entitled to receive the same amount Chongwe district is getting to build a new market to be fair, because the money is coming from the President. I hope the world Bank, IMF and the Africa Bank are watching what is going on, if anybody lends founds to this type of leadership please pleeease don’t demand the less connect to pay you back. What happened to the moratorium on expenditure? The President has to promise a new market every time he visits a community, what happened to planning and sequencing? Now the Minister of Finance has to find or borrow money not for structured development but to please the President. This is what has brought our financial and economic status to its knees, the Satanomics of declaring new districts and offices is the genesis of these problems that we have inherited. And yet we don’t seem to learn from our mistakes but continue on same path of just waking up and instructing and directing without thinking and considering merits and demerits. No wonder civil servants are unable to execute, most are impossible to implement. You are waking up now eh!! Very soon he will be campaigning 4 Miles Sampa and am sure he will promise a market in each 7 constituency.! Imagine Provincial Minister is also campaign manager for a Mayoral candidate …I see already a case for abuse of power. Imagine an opposition candidate wins only to have to work alongside the selfsame individual who was insulting you as your senior in the name of Bowman. 1.6 & 1.10 jj, there you go again, we can tell by their fruits and yours. What do you say about h.h on the same subject? Ok don’t worry and don’t answer, I know you inside out and where you stand. I also know that you will respond in four letter words which generally confirms who you are and your affiliations and where your loyalties lie. You know nothing about loyalties, its a big word for you …Where is HH on the same subject? Was your silly HH also in Chongwe cleaning? How old are you? What Primary school do you go to…surely can’t you engage someone on the subject at hand without mentioning your fellow stupid morons from UPND? There you have a Head of State talking about municipal issues…he cowers from national issues, why did he not talk about the proposed Nuclear Plant in Chongwe? He had to wait a 2 weeks to respond to Black Mountain …yet he invited those Jerabos to State House…he has failed to act on his Mines Minister. Don’t mind these black black upndeads. Natural haters. Worked out complainants. What leadership is this where you are putting on a Musk (PPE) alone and you don’t get everybody else involved to do the same? We want to see the same zeal when it comes to cleaning up the vice of plunder and corruption! It’s years now and we have not seen any action on obscene reports of PF corruption from the Fire Tenders, AG and FIC reports! You will die lamenting, c’mon get a life. Check your life and don’t wait for your imaginary leader to do something about your problems. #15.1 jj, the President doesn’t operate at your pace or at your level so don’t expect him to do exactly or even remotely as you think, ati if he is in Kenya jj says he should be in Egypt, what is the matter with you and your fellow upnd cadres kanshi? Now you have not told us who is your better option to be called His Excellency of or President of Zambia, of course not directionless h.h as you will confirm yourself? For sure you Tongas are very good at hating people,once you hate somebody, only the devil knows, you can only rule the cows not Zambians.If it was HH ,you were going to say ,leading by example.You are only fit to rule animals in Southern province. Stop this type of stereotyping and generalization. This is not healthy. Your thinking is like that of an animal. How can a person who has been exposed to education think like that? You are a bigot. You are an embarrassment to humanity. How about finishing off all the “modern” markets you have started building – they are all over the show but noone can use them as they are unfinished !!!!!!!!!!!!!!! For cleaning; i give him credit; but he and his party created the mess; since January; I was not expecting the president to be doing the cleaning by now; Zambians are filthy; and where is the minister of community development; where is the minister of health? Where are health inspectors? This govt can afford to ferry cadres to KK airport to see Lungu off and back; but can’t afford to provide dust masks for everyone cleaning;and why the president be promising to build markets? why do we have councils? Let’s do it! The other guy, it will never make it. Modern market? And when will that be ready??? Tiny little Tokyo market which was to give trading space to 1000’s of Lusaka’s vendors within a month of being displaced hasn’t done so in 7 months!!! And theres absolutely nothing modern about it! Chongwe, you’re in for a looong wait. If you’re lucky, yours will probably open just in time for the next elections. We talking years! Starve so long! “I do not want a situation were people from Lusaka with big bellies and thick Necks come to take over trading places in the new main market”. What a lousy thing of a pretender for president! Why use such cheap half-child language?In the next elections, I will contribute like never before to ensure that this lousy pretender never returns to power.